Right now the "show subtasks" toggle will only include subtasks in the list view if you're sorting or filtering. I would like to be able to show subtasks when I turn on toggle *without* sorting or filtering. I recently noticed that when I sort on Due Date, and switch on the "Show Subtasks" toggle, I see a list of Tasks and Subtasks as expected , though each Subtask appears twice: once among the items sorted by due-date, and again under its associated Task (see screenshot). If I switch off the Show Subtasks toggle, the Subtasks only appear under their associated Task. I responded to the survey on this topic, though I'd like to give some more feedback if possible. As a user, I'm accustomed to seeing Subtasks indented in List View. When I sort by due-date (and toggle on Show Subtasks) the result looks cluttered and difficult to use. I think indenting Subtasks in the sorted List View would help greatly. The small text providing the Task name adds clutter as well. I use long task names so that when they show up on a G-calendar, the assignee will immediately understand which project the Task relates to. It may help reduce the clutter if the small Task-name text were limited to one line, with the option to hover over it for the full Task name. Thanks for considering this input. Please let me know if I should post this feedback as a new item rather than comment here. I hapen to use short sub-task titles, because many of them repeats under their apropriate parent-task, e.g. Customers and under first contact, organise appointment, meeting etc. - so the parent-task title showed helps (though, not needed in a nested list view). In other use-cases sub-task titles I weite are longer. My opinion is that we meet different use-cases and we have different habits. Also, we must listen to our Customers' need, too. I would prefer to have the above mentioned feature as an option. 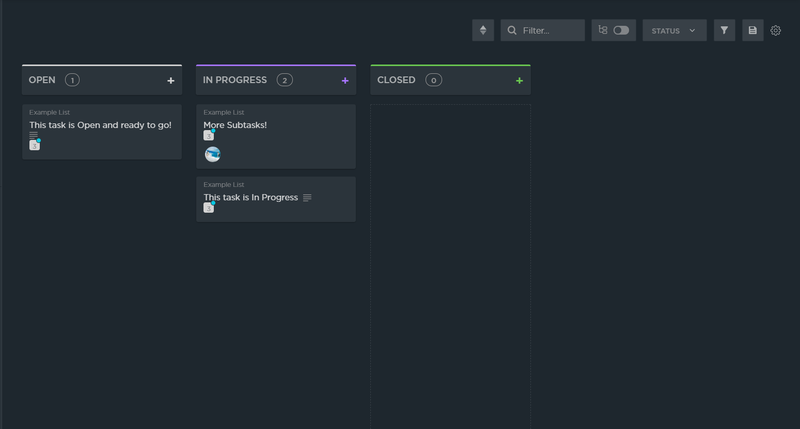 Toggle the visibility of all subtasks in the current project/list. Show subtasks in List view. I am all for cleanliness of the interface, but it would be great to have the option to show subtasks underneath their parent tasks in the List view, preferably indented or using some other manner to show their dependency. Yes, please! I really mis this one coming from Todoist. When displaying subtasks it would be really helpful to be able to group / fix the subtaks to their parent tasks in all views. For me personally that would be prefered over having them be filtered by other criteria (otherwise why not just make a new task), but I can see how others would want this as an option. It would be especially helpfull for the time and gant view. Is that isn't possible it would at least help to view the association with the parent task in time and gant view the way it is currently displayed in the list view. That's great to hear ! This is part of ClickUp 2.0 and will be shipped with that, end of Winter. I would also like an option to display subtasks all the time in board or list view. I believe a simple slide button to show or hide all subtasks in board view is the best option. I also think that showing closed subtasks as well should be included. Another feature I would really like to see implemented is to be able to tick the subtask to mark it as completed without having to open it. Any new ETA about it ? Thank you. An option to 'show/hide all subtasks' would be preferred beside the filter options. I would also like a selector for hierarchy level (1-2-3-4-...) when nested tasks-subtasks are implemented. Yes, please provide an option to automatically show subtasks in project/list view under it's parent task (nested subtasks) without the need to click extra buttons. As someone mentioned there could even further be an option to automatically show nested subtasks based on their status. Agreed. I would like the option to have completed subtasks stay visible. This is currently how checklists behave. 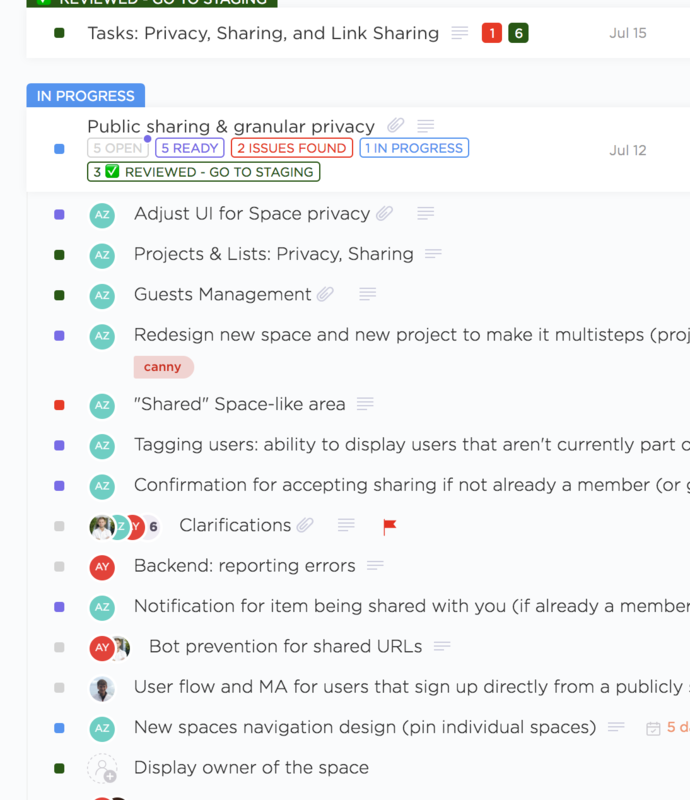 I mentioned another request where I feel subtasks aren't properly highlighted. However, it would also be nice if they could be formatted the same as regular tasks. For example, a colleague and myself found it weird that the subtask items (such as due date, priority, assignee, etc.) aren't displayed the same as regular tasks. We feel as if they should show up in the same column as the regular tasks so we don't need to look somewhere else to identify the status. Additionally, if a subtask is provided a due date, it would be great if this could show up OUTSIDE the actual task (when sorting by due date) so we know the subtask is due. Right now, it kind of "hides" beneath the main task and you actually have to click the main task to find it (unless I'm doing something incorrectly). I believe this has been mentioned in a similar request (albeit different). I think subtasks should look different when shown. Right now they just appear as a small list when, in reality, it would be great if maybe they showed up as a regular task (encompassed in a box like the other tasks) but maybe with a different color to differentiate between regular tasks and subtasks? The use of the sub- versus the regular tasks makes me not want to use the subtasks at all, but I do need them or my lists will be complete chaos. I am really confused why the subtasks are not just exactly like tasks, but within tasks. And I just want to be able to see them all, all the time. Also when I try to move regular tasks to subtasks the order reverses completely. Looks like the last update for this one was in July, quoting end-of-year. Any further roadmap clarity? @Ryan Miyagishima: Hey Ryan! Unfortunately, this feature has been delayed a bit in favor of higher priority features. This is definitely still a priority for us and at this time, we plan to add support for this at the end of the year. I greatly apologize for any inconvenience this causes you. View all doesn't display subtasks unless some kind of filter applied. When filter applied, subtasks are separate from the task they're associated with. Don't even understand the logic of that. There should be a way to show EVERYTHING in a space in list view in the correct hierarchy. From there, allow list to be filtered down. I generally enjoy organizing my tasks into multiple subtasks, and it would be a breeze if there was a button to be able to show all subtasks right away like in the image attached. I could do the same thing by clicking all the icons that tell me that I have subtasks under that task, but that is slightly more labour-intensive, and is only temporary. As soon as I switch to a different view, or reopen Clickup, the subtasks become little icons again. I think there should be a little switch that says "view all subtasks" or something along those lines. Thank you for making Clickup so amazing! I would not necessarily want to see _all_ subtasks, but at least the subtasks that have a **different status** from their parent task. Yes. Should be able to make this default too. I prefer to see subtasks along with everything else in List view. was just going to add this as a suggestion. Definitely want to see this implemented. Also, to add to the confusion, the show subtasks toggle does not work with some filters... E.g., in board view, having the toggle 'on' and filter on assignee does not make subtask show up. Neither does filtering on statuses. These inconsistencies does make it quite hard to get how that toggle is supposed to work. @Rickard Armiento: As another new user, I have to agree. If the bulk of a company's team tasks are *actually* subtasks, but they are all nested in most of the views, it's much harder to see the whole picture of a manager's team. There's a lot more clicking down than would be necessary in other tools I've used. It's great that it is designed to get this granular, but to not be able to have a top level view of it...I do not think manager's will like. I agree. And sometimes I wanna show them all at once instead of clicking it one by one. 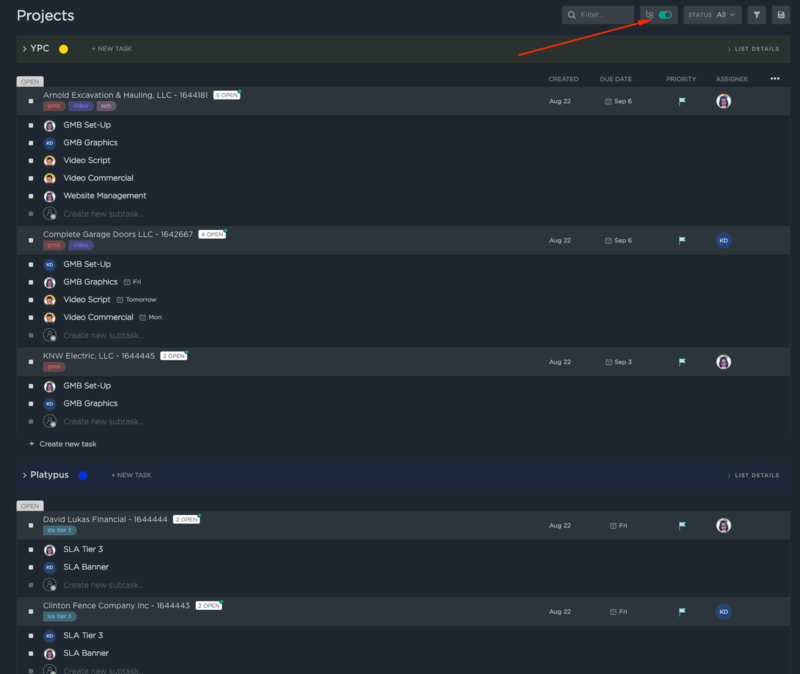 It will then look like this where you click the toggle button to show subtasks and automatically it shows all without the sorting or filtering. 55 upvotes, planned since end of april, status? 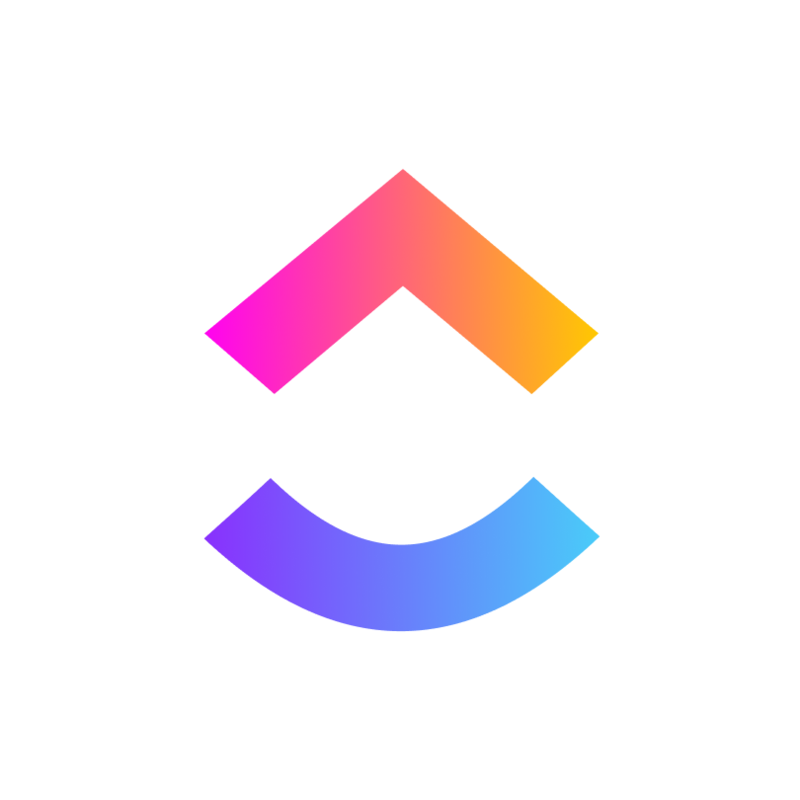 @Green Trailer: This one is a lot more complicated than it seems, it requires implementing new global indexes for subtasks, subtasks within statuses, and subtasks within lists. We'll get there but it's low priority especially since generally our competitors don't have anything like that. Right now, a good estimate is end of this year. @Zeb: hmm ok. sad to hear. my PM tool using subtasks that way... even todoist can do it. so the competitor argument is a bit low. @Green Trailer: You can expand all subtasks with a toggle in todoist? Could you please show me, I haven't seen that. Which PM tool are you using? @Zeb: i dont say with a toggle, and thread intro also doesnt say. to see them without filtering is the thing. like todoist or ora. @Green Trailer: This thread is indeed about the toggle, it's mentioned twice in the post description. So I'm not sure what you're asking for then, because we already allow you to show subtasks in List/Board view like Todoist, you can click them to expand them. Can you please explain? 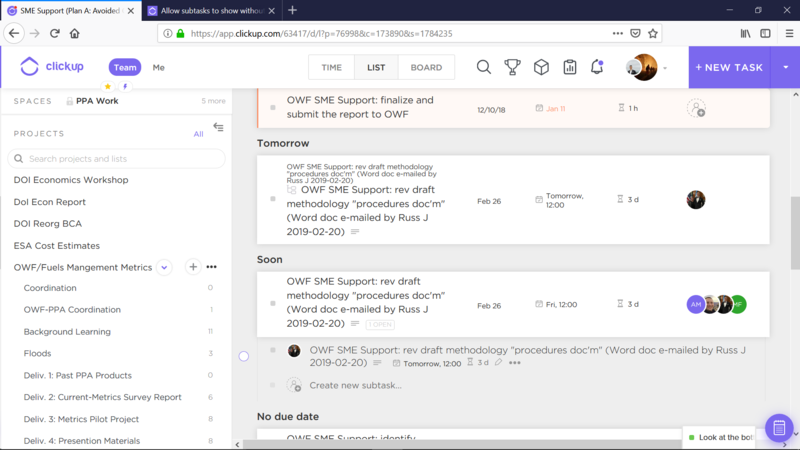 @Zeb: ok so i can see subtasks without filtering? and i can add a subtask to a subtask? may i ask me to show how to? tyvm! @Green Trailer: Sure! Click the Subtasks icon in list view and the subtasks will become expanded. You then can also create a new subtask from there. 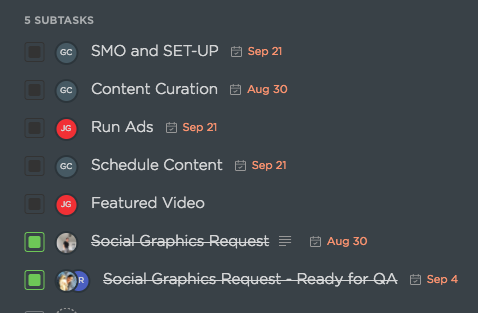 @Green Trailer: As of now, we've limited to only one level of subtasks, but allow you to add checklists on subtasks. @Zeb: Hope the Clickup team is still working on this feature. I'm a new user and this issue is one of my biggest frustrations with the software at the moment. It would be great if there was a toggle that expanded the entire view to show the tasks, but also all of the subtasks. Right now they're tucked inside of a task, and to view them you have to click on the small indicator or click into the task, but I want to be able to see all of my subtasks without needing to click every single indicator to expand the subtasks. My team has settled into using tasks and subtasks on our ClickUp boards. We may have 20 tasks on the board, and if we want to know the next steps (subtasks) for each of the 20 tasks, then we need to click the small boxes under each task. It's tedious, takes a lot of time, and it's easy to reset it by accident when you switch views. 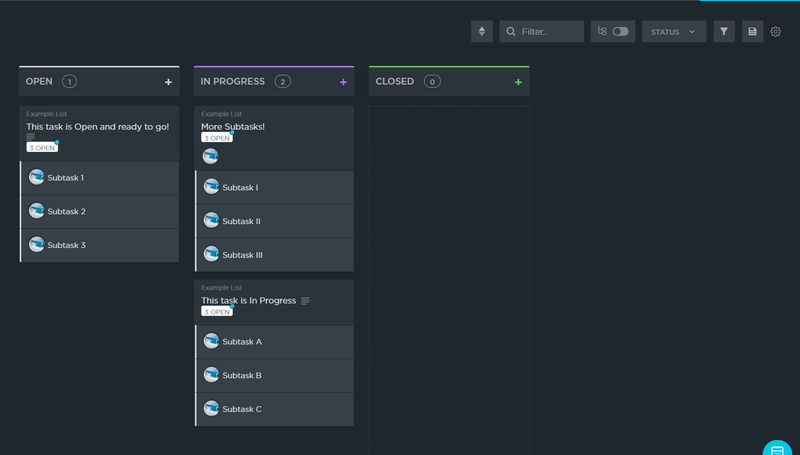 What I would like is a possibility to unfold all the subtasks under each task's card, so that my board shows both the tasks and the next steps (subtasks) for everything we're working right now. That'd be absolute perfection for me. I think the current sub-task expansion functionality in list view is really very good as it is. The UX is clear and the expansion task by task looks nice. That said, my finger constantly wants to flip the sub-task Boolean switch to see ALL sub-tasks expanded in a list and very rarely do I want to filter by task only and not by sub-task. In other words, I would vote to change the behavior of the switch at the top of the list view to expand ALL sub-tasks leaving the open the option to expand or collapse tasks > sub-tasks individually. Equally, I could probably live without a sub-task filter entirely or get along just fine if it was buried in the filter conditions list. @Brad Johns: We agree with you Brad! We'll get that done. Scheduled for 1-2 months, it's a bigger task than it seems. @Zeb: I'll keep my itchy finger tame until then ;) .. thanks! I'd also like this functionality. I'd prefer the ability to set a default in the Project, then per-task be able to override the default. Completed tasks should also stay where they were on the list, and not be moved to the bottom. @Anna: This would be a great help especially in calendar view where it is difficult to figure out the context of subtasks before dragging them to a date. @Nathan Hackett: I have noticed that in calendar view both the Task and subtask are listed. But they should be nested under the parents. In other words you should be able to show or collapse. @Yanky Follman: Yes, nested is the right word. I think it would be great to have a control to expand/collapse all, but it would also be useful to expand the subtasks for one task at a time. I enjoyed a similar feature in Wrike. I see that ClickUp allows this under the Me view, just not (yet) under the Team view. I also see that in List view, a Task with Subtasks has an icon to the right of the Task name indicating how many Subtasks it has. @Mike Meyers: Currently, you can show the subtasks nested under the parent task. But, you can not expand/collapse all in the list view. Vote for that. Why do I have to apply a filter to be able to toggle the "show subtasks" button?